Looking back, March seems little more than a blur. 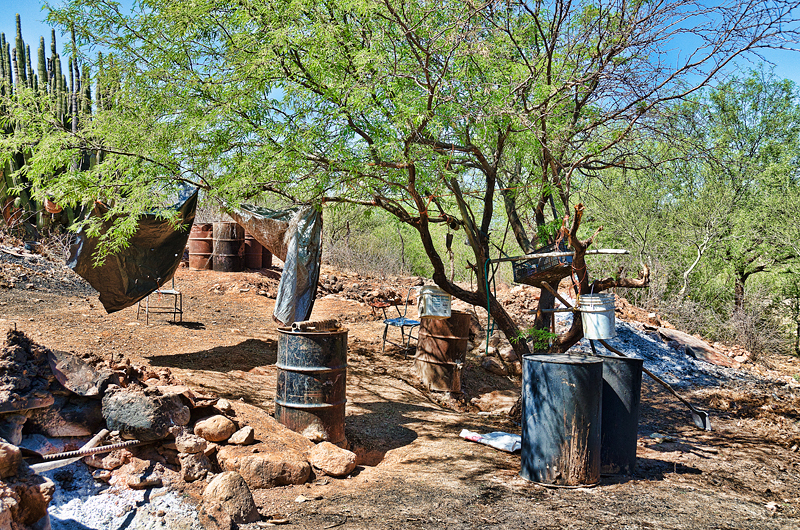 Our life was consumed by the state of Sonora. Either we were there or it came to us. Not only did the month of March look like a blur, in retrospect, so seems that arbitrary line called the border. 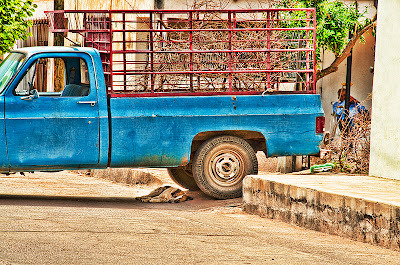 Crossing back and forth frequently almost makes it seem imaginary with perhaps the exception of the congestion at the border city of Nogales. So much happened during the course of the last month, all I will be able to manage is a brief description of each of our stops, when in fact, any of them are worthy of a more extensive write up. For that matter, I don’t know that I have a follow up in me after the last piece I wrote, that was something that reached deep within and in concert with a lot of emotion. Many thought, as do I, it was probably the my best post to this blog. I had a chance to visit with the family last week, share a Bacanora at their home and drive Viridiana to the group dance practice. 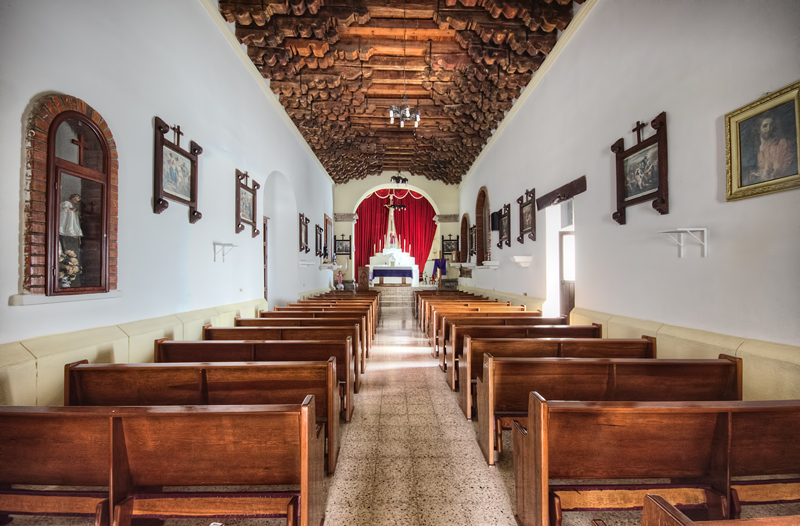 One thing I will share with you is the comment she made upon reading her story, not only does it reveal her feelings, but illustrates nicely the beauty of the Spanish language. Her phrase, “me hizo brotar las lagrimas,” in English would translate “it made the tears either well up or burst forth.” The word “brotar” is most commonly used in reference to plants when either sprouting or bursting forth. The language so beautifully makes the connection between human emotion and the world of plants. Viridiana Olivas and Xavier Mendoza – Xunutzi dance practice last week. What follows from here is basically a series of images that highlight different pieces of the month gone by, words are minimal, only what was needed to give some background. 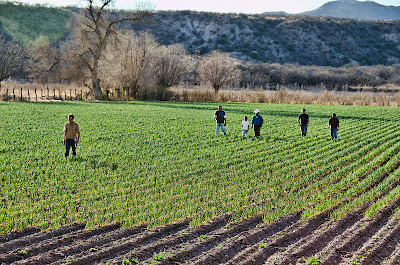 March began taking my friend Philip Ostrom of Patagonia Orchards whose company imports organic produce from Mexico into the States, to the tiniest of towns, Chinapa, Sonora, to meet with a family growing organic garlic. 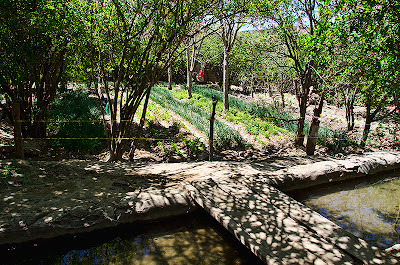 They never really thought of themselves as organic growers, but since they don’t use any chemical fertilizers or herbicides, they easily qualify as such. Probably the purest organic famers that Philip encounters, he had to walk them through all the paper work to make a purchase possible. The net result – 25 tons of garlic purchased. 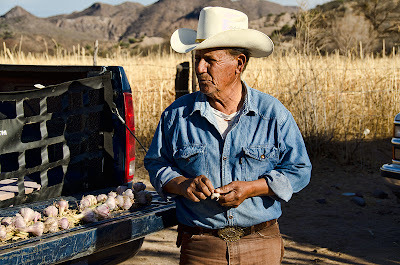 Antonio Madero, Chinapa, Sonora with garlic braid. Along on the trip, my son Arjuna, known to most as Oso, came along with me to help remove a fountain at the La Posada hotel in Banamichi. 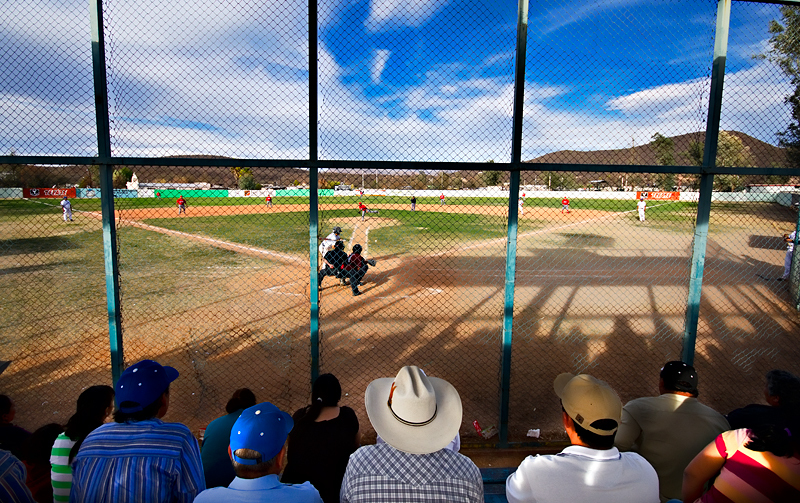 Having completed our task and having a Sunday free, perfect opportunity of the afternoon was to take on the the local baseball game between the towns of Huepac and Banamichi. Unlike the rest of Mexico, baseball is much more popular in Sonora than soccer. The afternoon and the images that resulted were nothing less than fabulous. 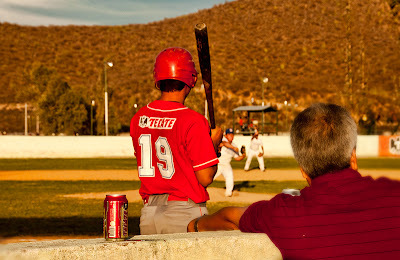 In short, the Rio Sonora baseball league is as much about Tecate beer as it is baseball. 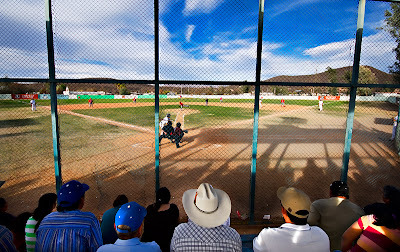 Huepac vs Banamichi, Liga de Beisbol – Rio Sonora. 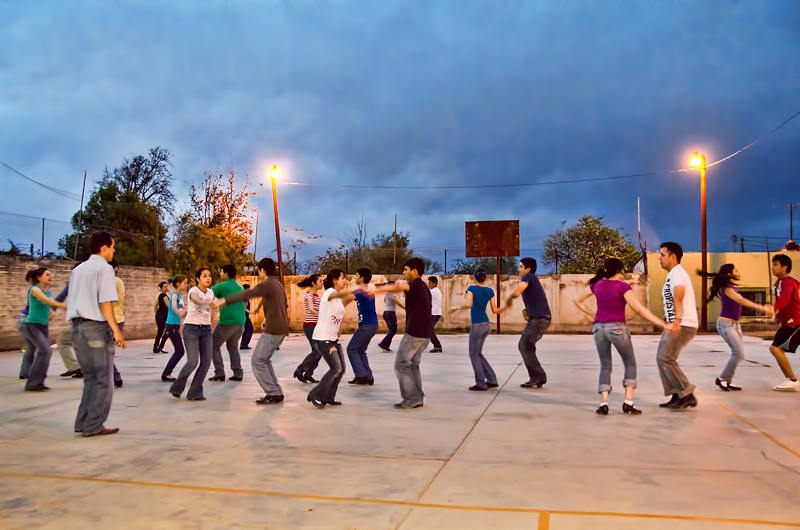 On our return back home, we welcomed the kids from the Xunutzi dance group to our home in Canelo. 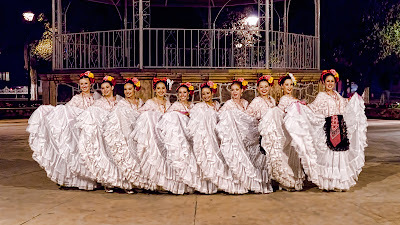 They came to perform in Tucson for the 300th anniversary of the death of Father Kino, the much beloved Italian Jesuit missionary for western Sonora and southern Arizona. 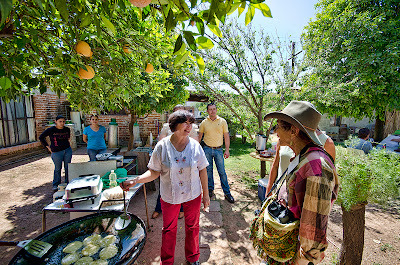 The event was sponsored by Friends of the Mission Garden complete with a Bacanora tasting and was attended by 30 some descendents of Father Kino all the way from Italy. This fund raising event was a precursor to a trip to Sonora later in the month. 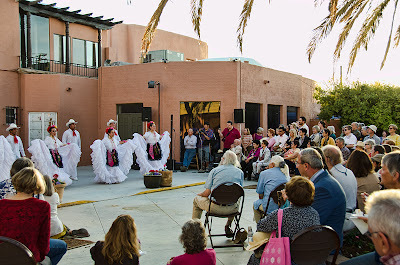 Padre Kino Fiesta organized by Friends of the Mission Garden, complete with the mayor of Tucson, guests from Italy, Italian TV, Roberto Contreras and Family for Bacanora tasting. 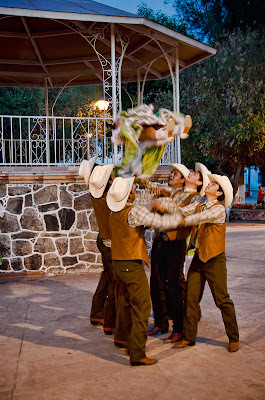 Whenever the kids of Xunutzi perform in southern Arizona they typically stay with us and sort of take over the place. 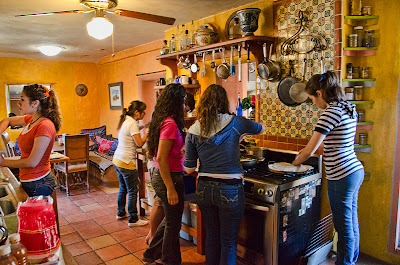 Breakfast underway in the kitchen. Sweethearts Jorge Salazar and Ana Gabriela on the computer. 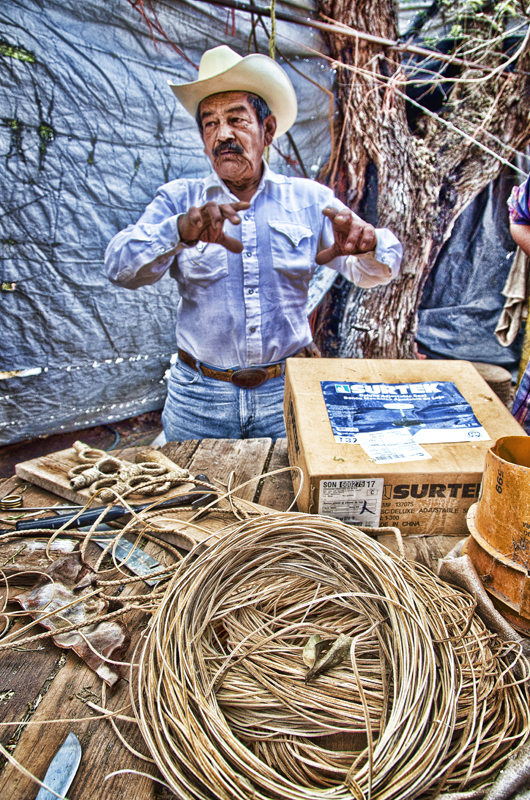 We returned a few days later to the coastal town of San Carlos to begin work on a small straw bale prototype for the state of Sonora. 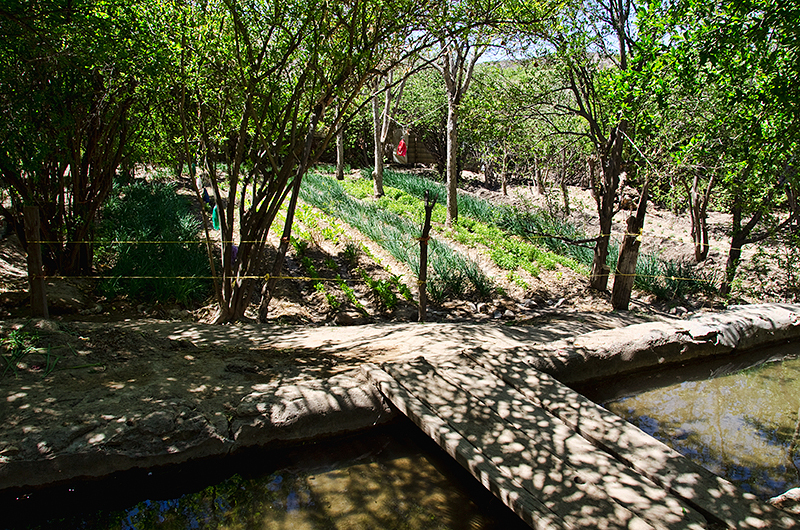 The project is under the wing of a branch of the Sonoran government called CEDES which essentially means the commission of Ecology and Sustainable Development. The idea behind the project is to come up with the smallest possible unit to accommodate a small family. The location is beautiful, an estuary preserve which is under their protection. 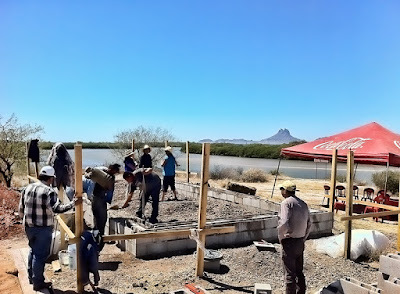 Straw bale building foundation at El Soldado estuary, San Carlos, Sonora. 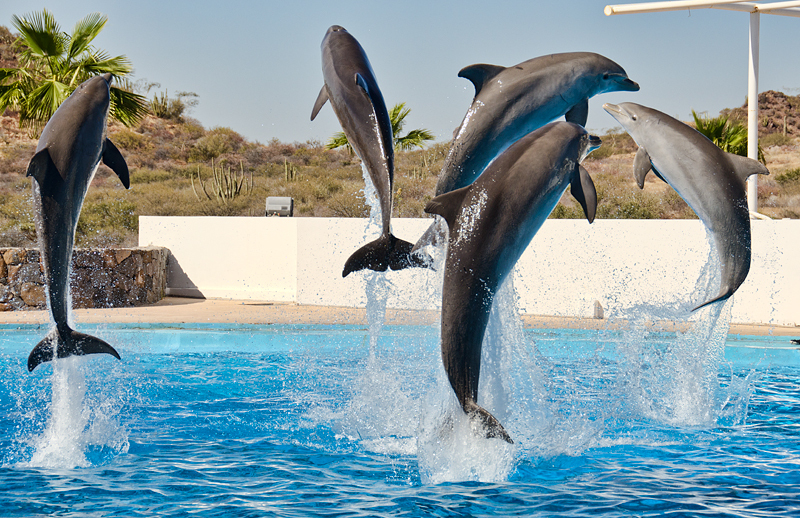 The estuary also has a complex for dolphins and programs that work with handicapped children. Since San Carlos is on the coast, adjoining the port of Guaymas, shrimp has a long tradition there. 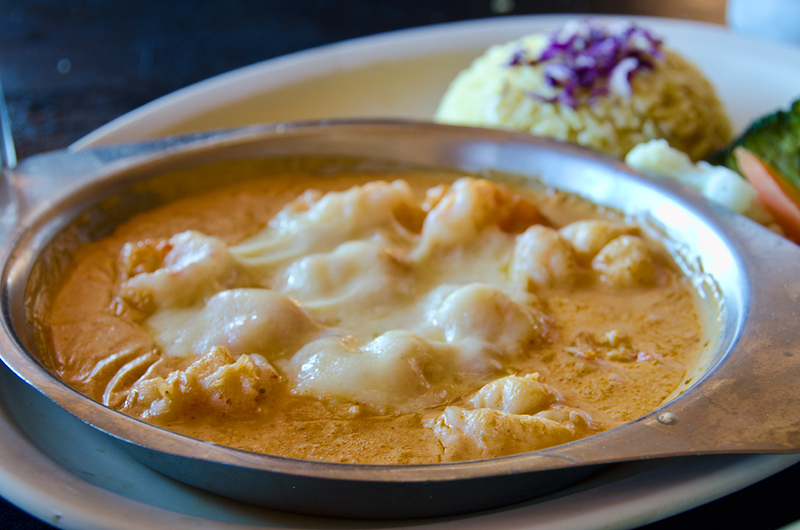 This plate – Camarones Bacanora includes a tomato and onion sauce with mescal bacanora and local cheeses. 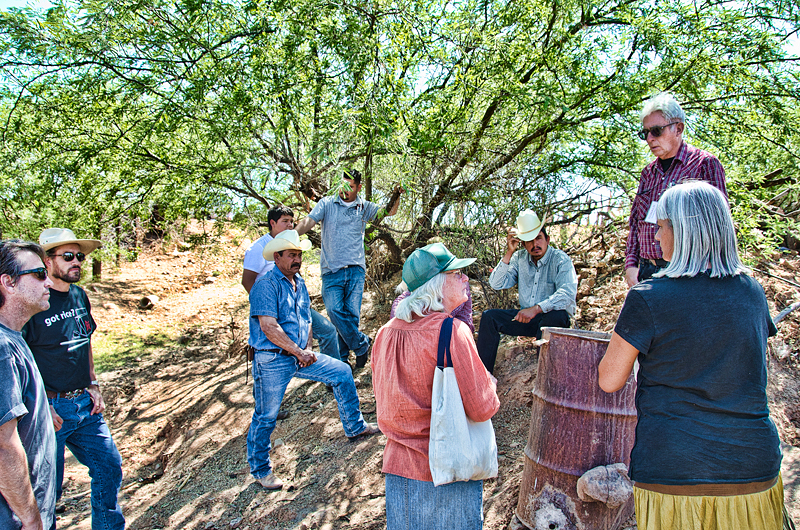 Our most ambitious undertaking of the month was to co-lead and coordinate a tour to the Rio Sonora for the Friends of the Mission Garden group from Tucson. Including drivers etc, the group totaled around 25 people and for the first run ever, I’d call it a success. It was similar to what we did for the group we hosted in February, but more formal, more activities as well as providing transportation. 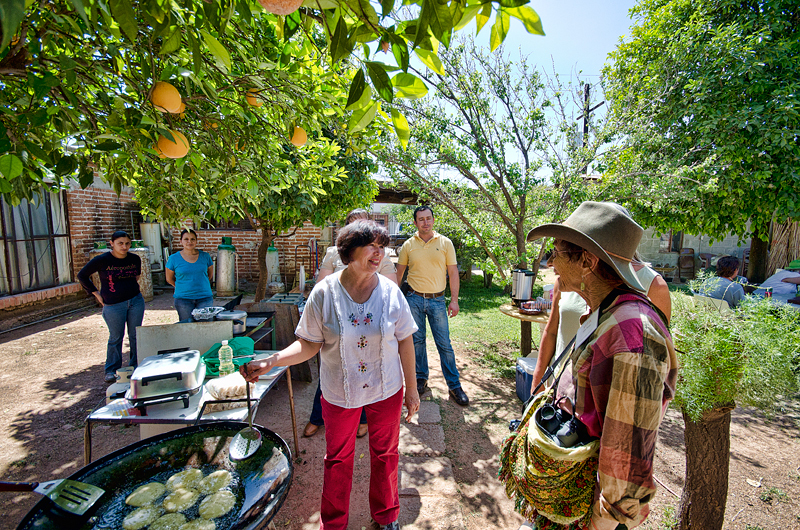 The first stop on the tour was at the complex 6 acre orchard/garden mixture of Casimiro Sanchez in San Ignacio, Sonora. As much as I love the complex arrangement of plants and trees in the orchard, his resting, cooking, eating area was every bit as good. This also happens to be a family that we’ve known and worked with for over 20 years. Too long a story for here. 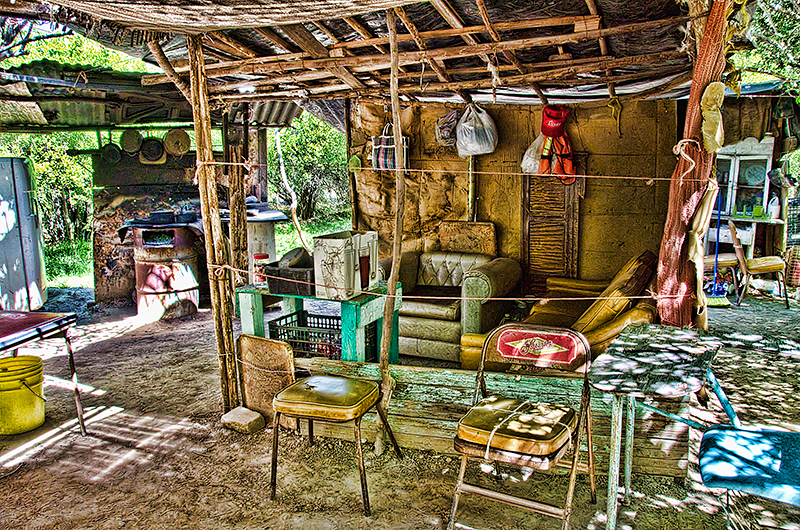 Our base for the weekend was La Posada del Rio Sonora in Banamichi. 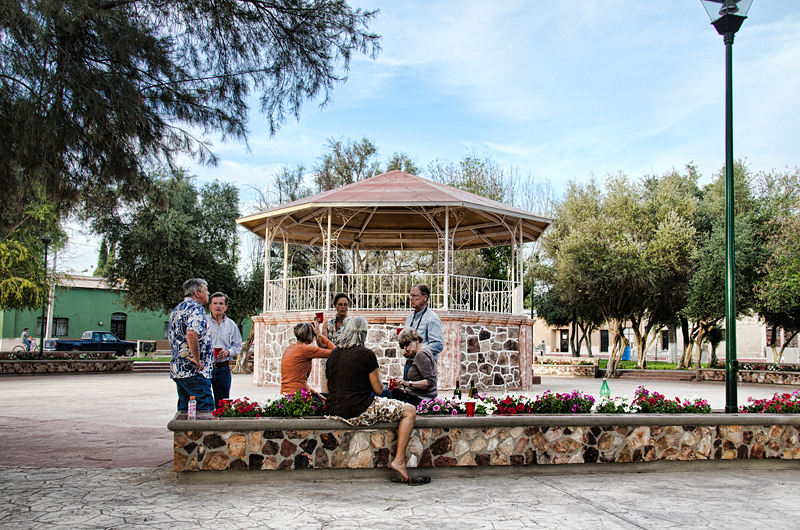 From there we scheduled various optional outings, one of which was the local churches and their plazas. 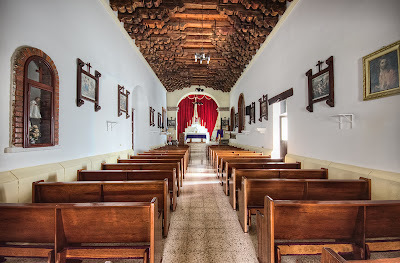 This the interior of the Huepac church, all the churches along the river date to the mid – 1600s. One of the more illustrious tour members – Big Jim Griffith of Tucson. 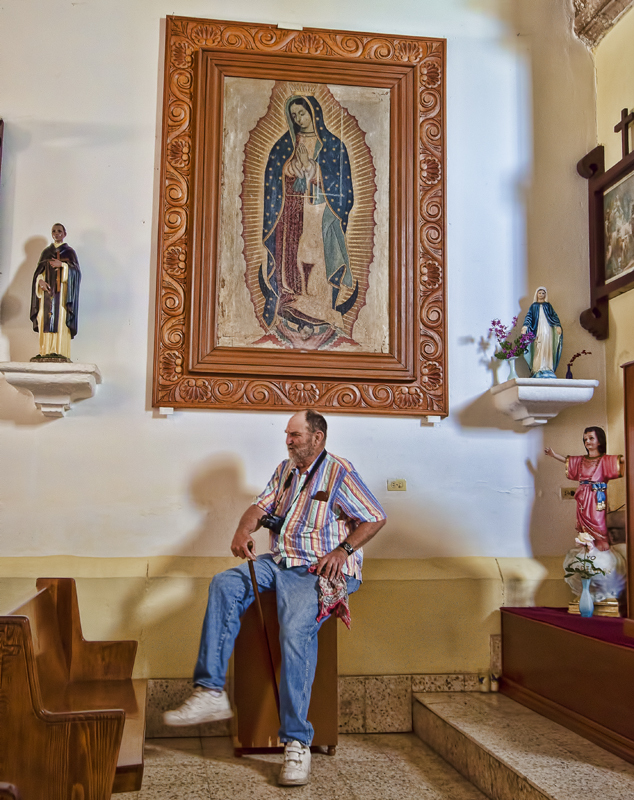 Not only founder to the immensely popular Tucson Meet Yourself festival, he is a highly respected folklorist for the southern Arizona and northern Sonora areas and an authority on religious art from the same area. Here in the Huepac church, commenting on the history and statues. 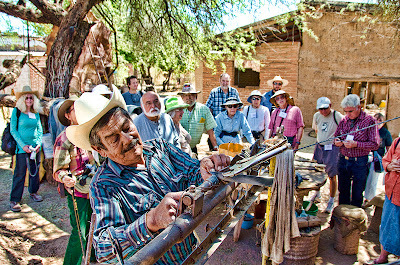 Like the small tour we did in February we also took this group to the Maldonado home in Estancia, Sonora for a Saturday afternoon meal/comida. Armida Maldonado talking with guests while preparing Sonoran style enchiladas. 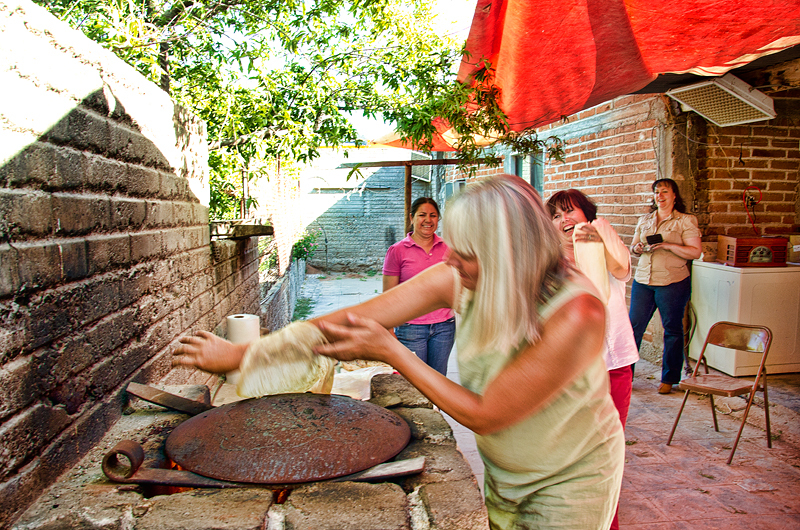 Sonora is famous for it’s paper-thin large tortillas called “sobaqueras.” Making them is not easy and virtually an art-form. However, that did not deter Athena from trying. Below is one of the local girls making one for comparison. Here is one of the best things I’ve eaten in quite a while. 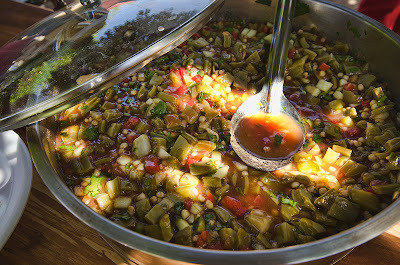 It is called “coctel de nopalitos,” or a cocktail of chopped prickly pear leaves. The dish is somewhat similar to what you would get with a seafood cocktail, this had small wheat berries in combination with the nopalitos. 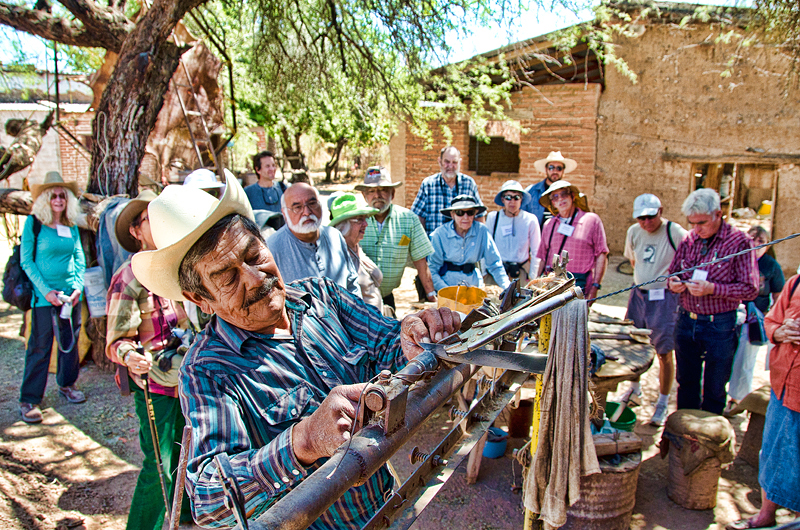 We also paid a visit to local rawhide worker Benjamin Barrios who works in the traditional way to make everything from ropes to whips, saddles and the like. 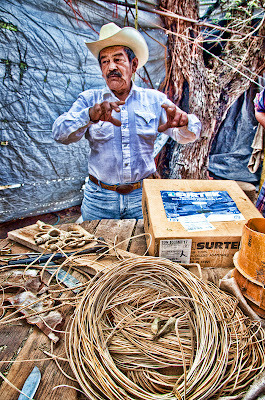 He gave a complete demonstration of the simple tools he has evolved over the years to make his work easier. Components of the still, but not assembled nor in operation. 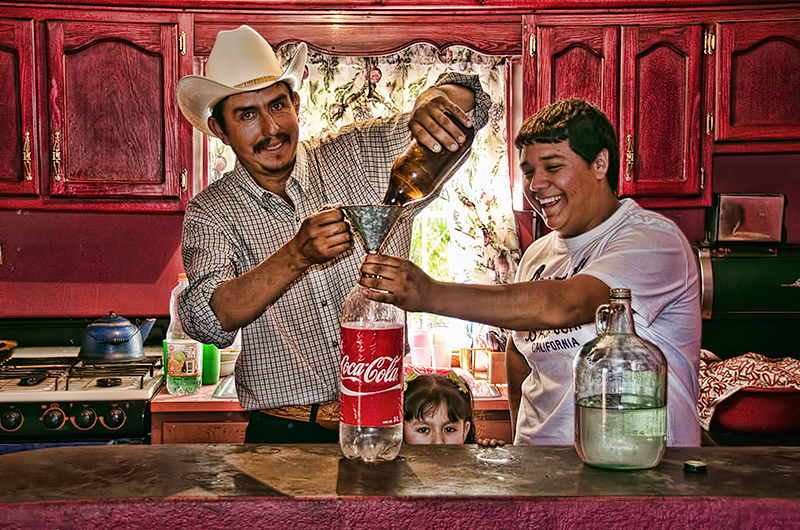 “El Cachimba” fulfilling a purchase request with Marco Baca jr., Huepac, Sonora. Our tour closed out on a Sunday evening with a performace by the Xunutzi Dance group on the Hueapc plaza. 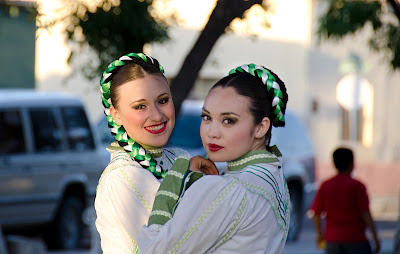 This is the dress for the traditional dance from the state of Vera Cruz which they performed one week later in competition with other groups from the state of Sonora. No surprise, once again for the fourth year in a row, they won first place. 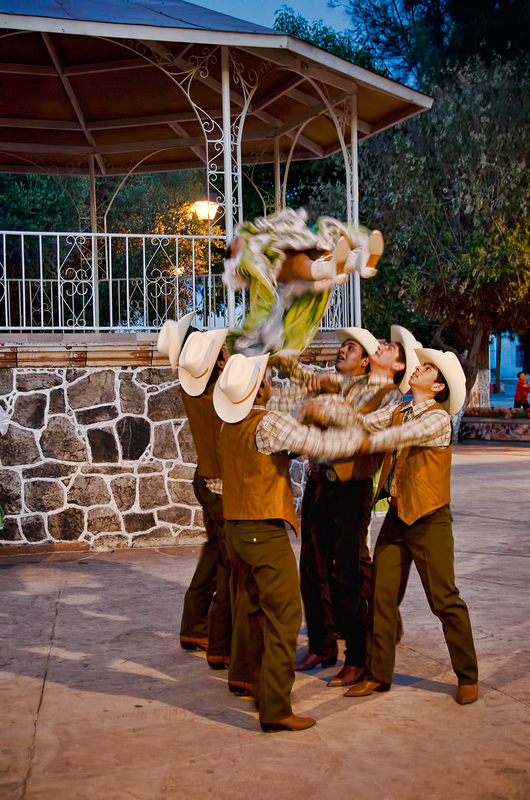 Component of the dance Sonora Bronco, where tiny Olivia Aguirre is tossed into the air. And last week, we wrapped up Sonora for now as we return to our spring Canelo Project workshops. 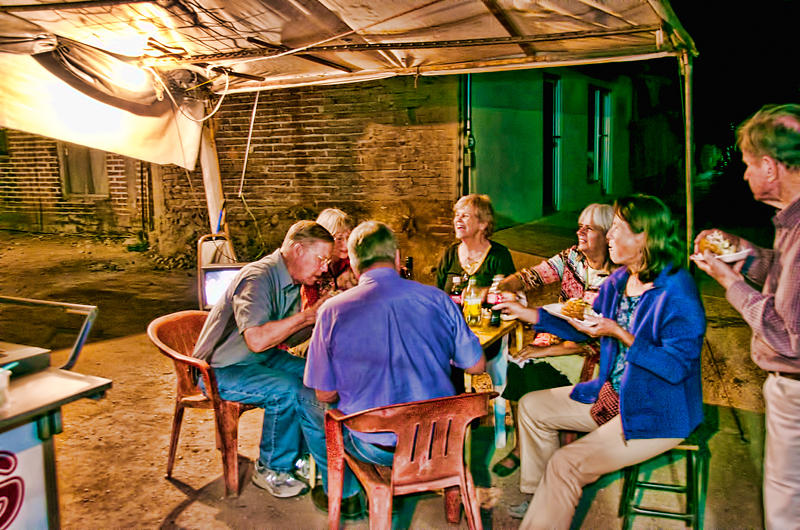 We accompanied our friends Peter and Jackie Ronstadt, Michael and Cathy Hard and my anthropology professor from the University of Arizona, Herman Bleibtreu. As a group they were relaxed, easy and a whole lot of fun. A first for me, but actually quite fun, we were invited to view the dance practice of the group. 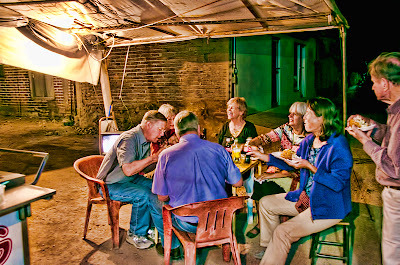 Peter, Jackie and friends suggested a wine and Bacanora hour on the plaza with Sonoran cocktail nuts before going to the practice. Indeed, it turned out to be bring closure to the afternoon. Increasingly popular in the States are Sonoran style hot dogs. 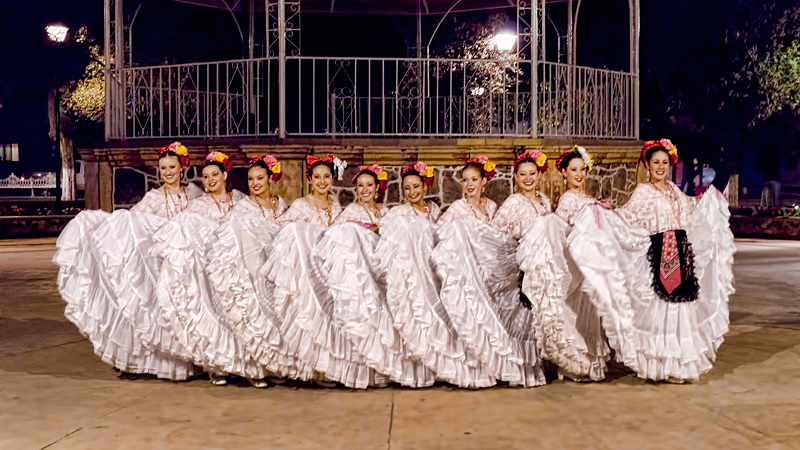 Of course, in Sonora, in particular the Rio Sonora they are significantly better. Part of that has to do with the buns, they’re fabulous and then somehow, all the extra toppings make them all that much the better. And of course, there are two hot dogs per bun. 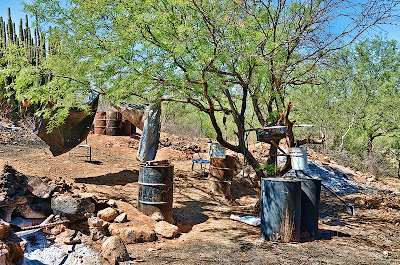 Perhaps this can be called a Sonoran dog house. Our short visit ended with a visit to the Xunutzi practice. Not only are they intense, it’s even exhausting to watch. 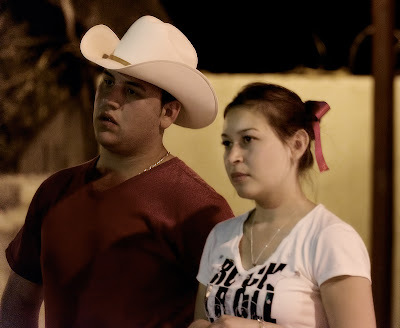 It was particularly special to be there in that one sees a whole another face of the group without their costumes in a public context such as the tired and more serious face of Olivia Aguirre of Aconchi. Thanks Matt, it's nice to hear from you and glad you appreciate what I wrote. Actually it doesn't take a lot of effort, the environment and people make it easy and irresistable. 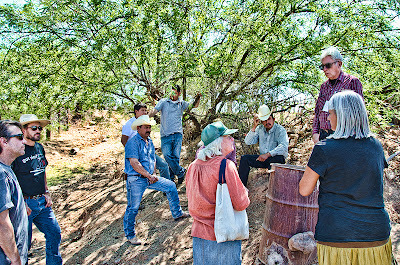 Next time you co-lead and coordinate a tour to the Rio Sonora please let me know I would LOVE to join you. Jill I most certainly will, I suppose the same goes for anyone else who would be interested in that type of trip. It won't be until next fall or early December. 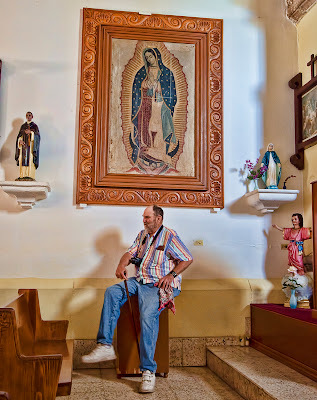 Always good to read your blog and I enjoy sharing it with others to show how folks LOVE Mexico ; I love your photos and how their stories continue to unfold. 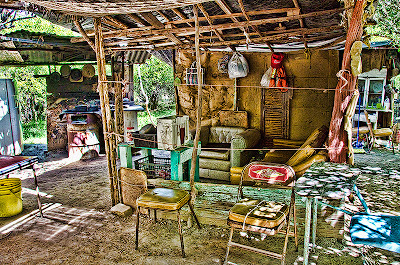 I sooo hope to meet you all one day; I hope to inspire folks here in Mata Oritz to see and learn some of the straw bale / sculpting techniques; I need to learn !! 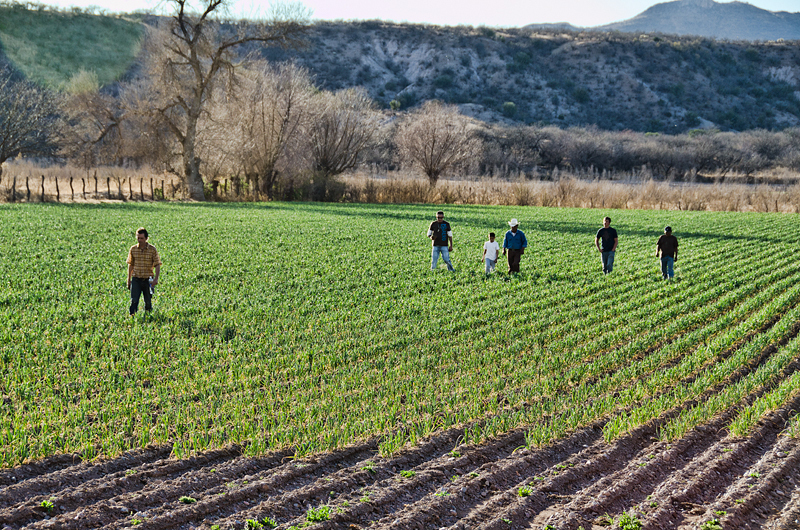 !whether in Sonora/NM/ or wherever – BEAUTIFUL !!!! THANKS FOR THE INSPIRATION ! Rachel, I'm sure it's possible to get that technology over there, question is how. We have another building to do in San Carlos and perhaps a whole lot of others. I think the trick would be to find an abanil or someone with good disposition and willingness to learn and get them over there to work on a project. That way they could get the training and pass it on in Chihuahua. Thank you Paloma, are you related to Ana and Virginia? I got another chance to check out your website today. Looks great. I was looking at your projects. I noticed the Rio Sonora project and wondered if you know my friends the Maldonado’s and Jesus Romo from Banamichi?